We know the dangers involved with electricity. Don’t take risks with your home or business. 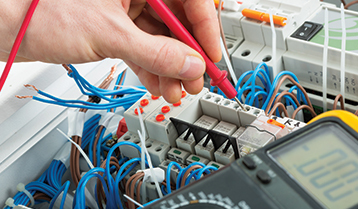 Let our expert electricians provide you with safe electrical solutions. From simple fault finding to complete rewires, upgraded fuse boards to meet 17th edition standards, new builds and extensions. We’ve got all your domestic needs covered. Safe Electrical Solutions Ltd pride ourselves on customer service. 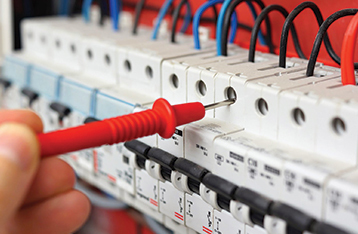 You can be sure when you approach us for any electrical services we will continually have the safety of your home or business at the forefront of your requirements. We have clear values, putting safety and the client first. We have a proven track record of effectively delivering on time and on budget, diverse electrical projects and services to a broad base of both domestic and commercial clients. Safe electrical solutions have maintained our 100 bed, 5-star nursing home since 2009. During that time they have impressed us with their knowledge, customer service, quality of work and of course, price. They have advised, planned and installed the latest LED lighting which will save hundreds of pounds over years to come, they also have completed our fixed wire inspection and all remedial with minimal fuss, they also service and maintain our emergency lighting as well as Portable appliance test and call out, in fact, all our electrical needs. Safe Electrical Solutions turned up and immediately were courteous and friendly. They took the time to make sure they had captured exactly what we wanted in terms of sockets, lights, and gave really great advice on kitchen lighting. The work was in stages along with the build, was fast and very professional and perfect. The changes they recommended (like using automatic outside lights rather than switched, and LED strip under counter lights, worked very well. Bonus points for coming and sorting out an issue at short notice arising from my DIY, Overall I can't fault them and would definitely use them again. Absolutely over the moon with the advice I was given to save money with these efficient electric radiators. The salon is so much more comfortable in temperature and the boys were extremely tidy with their workmanship. I couldn't even tell they had been in the salon apart from the very stylish radiators they fitted. Stuart is extremely professional and trustworthy. He gave me a number of options before we decided on the end choice. Will definitely be using him again for any future work. Stuart and SES's work is impeccable. During the quotation process, Stuart sent through two quotes for me to compare, along with product descriptions of both so I could choose the right product for our home. The punctuality, cleanliness of work and professionalism was apparent straight away. The work carried out is both super neat and tidy. Test certificates for the work were sent through almost immediately after SES left the property. I will not hesitate to contact them for any future electrical work at my property. Work had to be done in stages around the construction project. All visits made at the agreed time, all unforeseen problems were dealt with very efficiently and finished installation more than exceeds our expectation. Perfect design and implementation to give a spectacular end product. Very well done. Prompt call out fixed the fault with no dramas, such a nice man even had a look at the washing machine and sorted out why it would not drain. Will definitely use again. Stuart did a fantastic job for us, he was punctual, polite, tidy, efficient and explained all the changes to the wiring/installation he had done. He was competitively priced, we would have no hesitation in recommending him or partaking of his services again.